The 2012-13 NHL season had no shortage of great games and amazing performances. NHL.com asked its writers to stroll down memory lane and pick some of their top moments of the season that was. 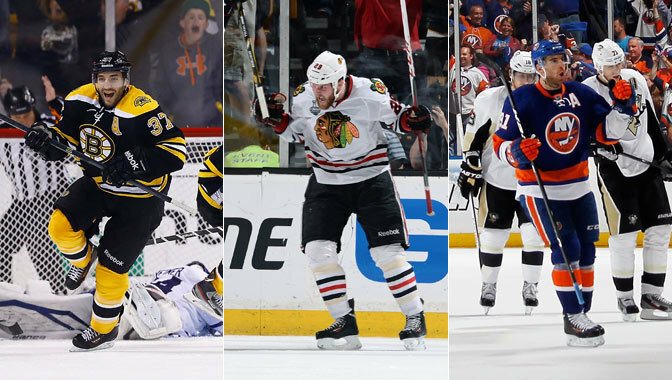 From the time of the first puck drop Jan. 19 to the final buzzer of Game 6 of the Stanley Cup Final five months later, there were a number of entertaining games that featured amazing plays, great comebacks and magical moments. This game was proof that no lead is safe and no score is set until the final buzzer sounds. The Red Wings had a 2-0 lead heading into the final minute of the first period, but Anze Kopitar used one soft play by Daniel Cleary along the wall in the Detroit end to win a battle, then outmuscled Cleary on his way to the net to bang in a return pass from Rob Scuderi with 40.3 seconds remaining to get the Kings back within a goal. The score remained 2-1 in the game's final minute, and Kings goalie Jonathan Quick headed to the bench for an extra attacker. That let Kyle Clifford jump on the ice, and he grabbed a loose puck just inside the Detroit blue line at the left point and fired a high shot on net. Defenseman Alec Martinez came off the left wall and tipped the puck down and into the slot. Jeff Carter had a crack at it, and the rebound of his shot went to Martinez, who had skated behind Carter and was in prime position to backhand the puck into the net to tie the game with 52.8 seconds left. The Red Wings may have been down, but they weren't out. Johan Franzen flipped a puck on net that Quick was forced to glove and hold for a stoppage with 14.1 seconds left. The Kings won the faceoff, but Cleary got to the puck along the back wall and tipped it to Jonathan Ericsson at the right point. Ericsson fired a shot that trickled between Quick's pads and across the goal line with 4.5 seconds left. Detroit's Jimmy Howard made a season-high 45 saves but after the game gave all the credit to Ericsson. "That's just a great play by [Ericsson] throwing it on net," Howard said. "You never know what can happen when you put the puck on net." Nine players scored and 21 had at least a point when the Penguins and Canadiens played the highest-scoring game of the season at Bell Centre. It started normal enough, with each team scoring once in the first period. Max Pacioretty put the Canadiens up 2-1 at 4:14 of the second, but the Penguins scored three times in the next 5:07 -- two by Matt Cooke -- to open a 4-2 lead. Brian Gionta scored to get the Canadiens within one, then P.K. Subban pinched down and scored from the post with 0.7 seconds left to tie the game after two periods. David Desharnais scored 5:25 into the third to give Montreal the lead, but Chris Kunitz and Sidney Crosby responded to put Pittsburgh ahead. But 20 seconds after Crosby scored, Gionta's second of the game bounced past Tomas Vokoun to tie it again. The game went to overtime but didn't last long. The Penguins broke out of their end, with James Neal carrying it over the Canadiens blue line and sliding it over to Simon Despres along the left boards. Despres centered it to Brandon Sutter entering the zone. He sidestepped a sliding Pacioretty, got into the slot and fired a wrist shot that beat Carey Price 52 seconds in. Though all the offense made it entertaining for the fans, neither coach likely was happy with the result. "I don't want to remember ever being in a game like this again," Penguins coach Dan Bylsma said. "I don't think [Montreal coach Michel Therrien] or I will like a lot on the tape." The Blackhawks entered without a regulation loss in 23 games to start the season, a League record. Extending the streak proved difficult. Andrew Shaw's goal midway through the first period gave the Blackhawks the lead, but John Mitchell scored to tie it with 1:20 left in the period, then Matt Duchene's goal in the second put Colorado ahead. Jonathan Toews tied the game when he walked around Ryan O'Reilly, cut through the crease and scored shorthanded 2:19 into the third period. The game looked headed for overtime when Viktor Stalberg and Marcus Krueger kept the play alive in the Colorado end in the final minute of regulation. Avalanche goalie Semyon Varlamov stopped Krueger's shot from the right side, but the rebound bounced across to Daniel Carcillo, who scored into a nearly empty net with 49.3 seconds left to give the Blackhawks the lead and allow them to extend their remarkable run to 21-0-3. It was Carcillo's first goal of the season, and he was the 13th player to score a game-winning goal for the Blackhawks. "A lot of people might think that we're pulling that game out of you know where, but really we're working for it," Toews said. "There's no special equation or whatever. There's no magic. It's just work ethic and the depth of our team kicking in." It marked the final game of the Blackhawks' run; when the teams played in Colorado two days later, the Avalanche won 6-2. After losing Game 1 of the Western Conference Quarterfinal series against the Anaheim Ducks, the Detroit Red Wings entered Game 2 desperate to bring the series back to Detroit with a split. They came out firing, with Justin Abdelkader wiring a shot past Jonas Hiller 48 seconds into the game. Damien Brunner added a goal a few minutes later, then Johan Franzen scored 1:04 into the second to make it 3-0 Red Wings. When Franzen scored a power-play goal 20 seconds into the third to make it 4-1, it looked like Detroit would get its wish of a tied series. But things changed in a hurry, starting with Ryan Getzlaf's goal at 7:20 of the third. Seconds after a Ducks power play ended, Kyle Palmieri found room over Jimmy Howard's glove to make it a one-goal game. Bobby Ryan completed the comeback with 2:22 to go in regulation when he finished a give-and-go with Cam Fowler to tie the game. The Red Wings were rocked, but the fight was far from over. A slashing penalty on Sheldon Souray in the final minute of regulation allowed Detroit to start overtime with the man-advantage, and they took scored 1:21 in. Valtteri Filppula made a beautiful play with the puck deep in the Anaheim end, pulling it around a sliding Corey Perry then making a cross-slot pass to Gustav Nyquist, who buried the puck behind Hiller to even the series. "It's a good life lesson for our crew and good for kids," Red Wings coach Mike Babcock said. "We have lots of kids on our team. They're not like veterans. They're just different." After an overtime loss in Game 3 of the first-round series against the Pittsburgh Penguins, many were wondering how the New York Islanders would respond. The game was tied 2-2 midway through the second period when Brandon Sutter scored at 11:03 to give the Penguins their first lead. It was looking good for Pittsburgh, but with 1:24 left in the second, Kyle Okposo, from well behind the goal line, tossed a puck in front that bounced off goalie Marc-Andre Fleury and into the net to tie the game. The Penguins came out in the first minute of the third period and snatched back the momentum on Pascal Dupuis's goal at 41 seconds, but the scrappy Islanders refused to go away. Mark Streit's long shot eluded Fleury at 4:30 of the third to again tie the game, then, at 10:11, John Tavares refused to be stopped and, with help from Brad Boyes, made a spectacular play to go between two Penguins then bang in his rebound to give the Islanders a 5-4 lead. They added an insurance goal with 1:16 left when Lubomir Visnovsky forced a turnover in the Islanders' end, and Casey Cizikas finished the play by walking around Matt Niskanen and beating Fleury with a shot along the ice. It was the Islanders' first home playoff win since 2002. "It's right up there, that's for sure," Tavares said when asked where his game-winning goal ranked in his career. "I've had a great four years and I'm just trying to stay focused on the moment." If there is one game from the 2013 Stanley Cup Playoffs that people will remember, it most likely will be Game 7 of the first-round series between the Bruins and Maple Leafs. It had all sorts of drama: The Bruins had taken a 3-1 series lead, but the Maple Leafs battled back to win Game 5 in Boston and Game 6 at home by 2-1 scores to force Game 7 at TD Garden. Toronto rode that momentum early, and a pair of goals from Cody Franson gave the Maple Leafs a 2-1 lead after two periods. They built on that lead in the first 5:29 of the third, with Phil Kessel and Nazem Kadri pumping the advantage to 4-1. Midway through the third, things were looking good for the Maple Leafs -- goalie James Reimer had stopped 18 of 19 shots and Toronto had killed all four Boston power plays. Then, at 9:18, the tide began to turn. Milan Lucic stormed down the left side with the puck, went behind the net, came out the other side and found Nathan Horton with a diagonal pass, and he one-timed a hard shot past Reimer to make it 4-2. "We were finally able to have a clean break out into a rush, which I don't think we had had in three games until [Horton's] goal," Lucic said. "It seemed like we started to play more reckless and taking pucks to the net and things like that." Lucic led by example; he bulled his way to the net to score to make it a one-goal game with 1:22 left, then Patrice Bergeron scored through a Zdeno Chara screen to tie it with 50.2 seconds to go. Bergeron capped the miracle comeback with a goal 6:05 into overtime. The Bruins rode the momentum from that win all the way to the Stanley Cup Final, and the Maple Leafs were left to lament what could have been. "We gave ourselves a very good chance to win this series, and we gave it away. It's that simple," Franson said. "We gave it to them." Despite winning a Stanley Cup more recently than their longtime rivals, the Chicago Blackhawks felt a bit of unfinished business, dating to the 2009 Western Conference Final, when they lost to the Detroit Red Wings. A year later, the Blackhawks won the Cup, but doing it without beating Detroit made it a bit bittersweet. It looked like there would be more sour to come for the Blackhawks when the Red Wings took a 3-1 series lead, but Chicago battled back, winning Games 5 and 6 to force Game 7 at United Center. The Blackhawks broke the ice when Patrick Sharp finished a sensational passing play with a goal 1:08 into the second period. The lead lasted until the first minute of the third, when Daniel Cleary tipped a puck away from Johnny Oduya to create a 2-on-1 down low that Henrik Zetterberg finished 26 seconds into the period to tie the game. The game went to overtime, with the break finally coming at 3:35. Dave Bolland's big hit along the wall at center ice on Gustav Nyquist knocked the puck loose, and Brent Seabrook swooped in to grab it. He skated into the Detroit end, and as Niklas Kronwall gave ground, Seabrook used him as a screen to beat Jimmy Howard over his glove to close the series. It marked the first time in the Blackhawks' 87-season history they won a series after trailing 3-1. "It was a strong season and we had to find a way," Blackhawks coach Joel Quenneville said. "I think winning here in Game 5 got us excited again and got the momentum back. The last two games were tightly fought and amazing games." Days before Game 5 of the Western Conference Final against the Los Angeles Kings, Chicago Blackhawks coach Joel Quenneville said for his team to continue its run through the Stanley Cup Playoffs it would need more from its top players, especially Patrick Kane, their leading point-producer in the regular season. Kane responded with a goal in Game 4, but it was his first in eight games. In Game 5, he gave Quenneville everything he wanted. He followed Duncan Keith's first-period goal with a score of his own to give the Blackhawks a 2-0 lead after one period. After the Kings tied it in the third, Kane's quick one-timer from the slot with 3:52 left gave Chicago the lead. After Los Angeles forced overtime with a goal with 9.4 seconds left in regulation, Kane became the hero when he ripped a shot over the glove of a sliding Jonathan Quick to cap his second playoff hat trick and send the Blackhawks to the Stanley Cup Final. As Quenneville said after the game, "That was more than more." There really was no better way to start the Stanley Cup Final than with this classic matchup between Original Six rivals and recent Stanley Cup champions. Milan Lucic gave the Bruins a 2-0 lead when he scored his second of the game 51 seconds into the second period, and after rookie Brandon Saad got the Blackhawks on the board at 3:08 of the second, Patrice Bergeron restored the Bruins' two-goal lead when he scored 6:09 into the third. The Blackhawks snatched back the momentum when an Andrew Shaw takeaway led to a Dave Bolland goal at 8:00 to make it a one-goal game, and they tied it when Johnny Oduya's long shot that was going wide of the net instead ricocheted off the left skate of Bruins defenseman Andrew Ference and behind goalie Tuukka Rask at 12:14. The tie held through two overtimes, and in the third the Bruins had a glorious chance to win it. Chicago goalie Corey Crawford stopped Tyler Seguin's shot from above the circles, but Kaspars Daugavins crashed into the slot to grab the rebound on Crawford's right. Daugavins tried dragging the puck around Crawford so he could tuck it into the other side of the net, but a sliding Oduya made a phenomenal play from his belly to tie up Daugavins' stick just enough to deny him a clean shot into what was an open net. Two minutes later, the play loomed even larger when Michal Rozsival's shot bounced off Bolland then Shaw before finding a spot in the back of the net, ending the fifth-longest game in Stanley Cup Final history at 12:08 of the third overtime. The story of the 2012-13 season ended about as wonderfully as any hockey fan could have wanted. At home for Game 6 of the Stanley Cup Final with the season on the line, the Bruins started the right way when Chris Kelly one-timed a Tyler Seguin pass from in close to open the scoring. But Blackhawks captain Jonathan Toews singlehandedly tied the game, winning a neutral-zone faceoff, tipping the puck past Bruins defenseman Zdeno Chara then snapping a shot past goalie Tuukka Rask at 4:24 of the second. Milan Lucic scored at 12:11 of the third when he took advantage of sloppy puck-handling by goalie Corey Crawford, and the lead held into the final two minutes. Thoughts started to drift to Game 7 in Chicago, but in quick fashion, the Blackhawks turned the narrative in a wholly different direction. Toews and Duncan Keith won a puck battle along the wall in the Boston zone, with Keith slipping a pass to Toews, who skated into the slot. Drawing the full attention of the Bruins defense, he fed the puck through the crease to Bryan Bickell, who scored to tie the game with 1:16 remaining. While the Bruins tried to recover from the emotional letdown, the Blackhawks were ramping up their intensity. Just 17 seconds later, Johnny Oduya fired a shot from the left side of the Boston zone that Michael Frolik redirected off the left post. But Dave Bolland got inside position on Bruins defenseman Johnny Boychuk and knocked the rebound into the net with 58.3 seconds left. Moments later, the Blackhawks were able to celebrate their second Stanley Cup in four seasons. "When don't you dream about it?" Bolland asked rhetorically after the game. "We all dream about scoring that Stanley Cup winner." And we all dream about seeing a Final game so entertaining.